To make the crispy crumbed egg, place a large piece of cling film in a small bowl. Brush the cling film with oil. Crack an egg into the cling film, then gather up the sides and twist to form a loose ball. Tie to secure. Repeat with one more egg. Cook the eggs in boiling water for 5 minutes. Then place them in a large bowl of iced water. Allow to cool. In the meantime, cook the noodles. Heat a pot of water over high heat until boiling. Add the noodles and allow to rest for a few seconds. Then use your tongs to gently shake the noodles apart. Once the noodles are separated, drain and transfer to the bowl of ice with the eggs. To crumb the eggs, place the remaining 2 eggs into a bowl and whisk them together. Place the flour and breadcrumbs in two other separate bowls. Unwrap each egg then dip each into the flour, then egg and then the breadcrumbs. Set aside while you stir-fry your noodles. To make the stir-fry sauce, combine the ingredients. Heat 1 tablespoon of vegetable oil in a wok or frying pan over high heat. Add the bacon and cook for 1-2 minutes or until starting to get crispy at the edges. Then add the onion and stir-fry for another minute. Add the gochujang paste and cook for another minute. Stir through the chilli flakes. Add the kimchi and stir-fry for another 30 seconds. Add the drained noodles and mix until combined. Add the stir-fry sauce and cook for another 30 seconds or until thickened slightly. Turn the heat off and keep warm while you cook your eggs. Heat a small saucepan of oil over high heat. When the oil is hot add the crumbed eggs and cook until golden. Drain on paper towel. 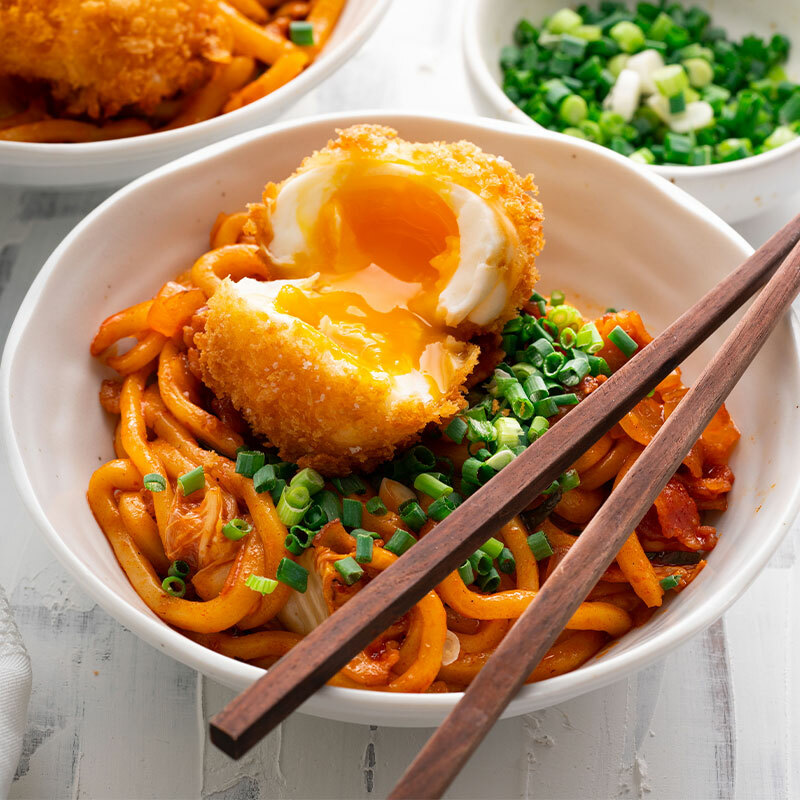 Serve noodles topped with the crispy, crumbed egg and sprinkle with spring onions. 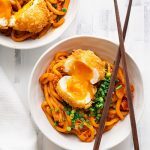 You can find pre-cooked vacuum-sealed packages of udon noodles in the Asian aisle or fridge section of major supermarkets or from your Asian grocer. 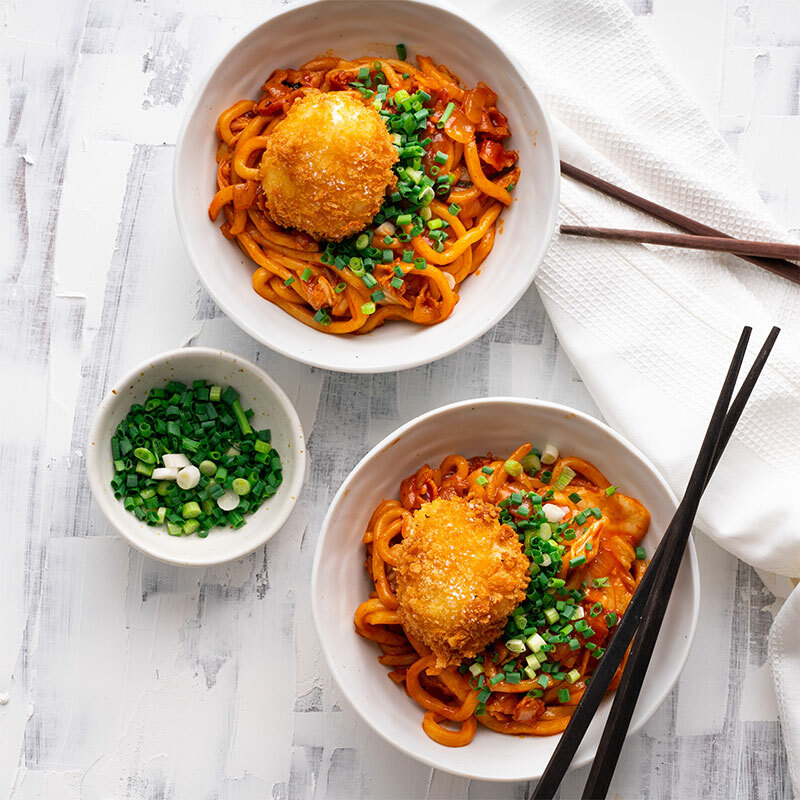 You can also find frozen udon noodles at your Asian grocer. Korean gochujang is a fermented chilli paste available in the Asian aisle of the supermarket or from your Asian grocer.